Track down the Marbled Morale Ainigmata Ostraka reward from the depths of the Porphyrion Cave to the quarry in southern Mykonos. 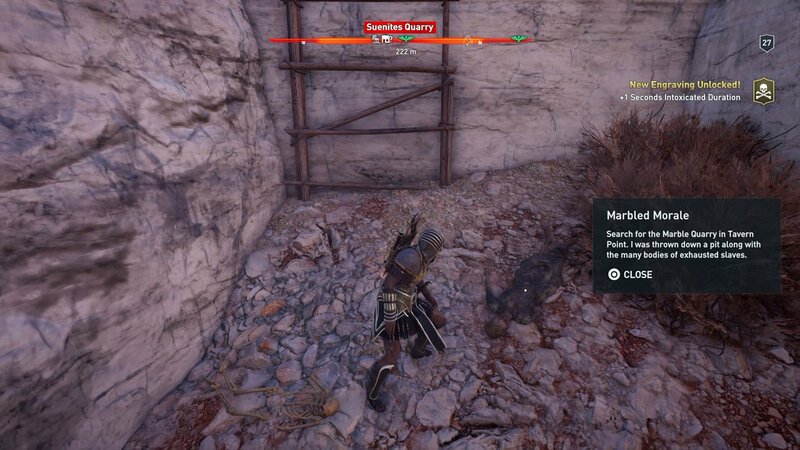 Assassin's Creed Odyssey players hoping to get the most out of their hero's combat abilities should be on the lookout for Ainigmata Ostraka, or "enigma tablets" that point players to the hidden location of various engravings. The Marbled Morale Ainigmata Ostraka can be found in the Porphyrion Cave, and points to a corpse-filled pit off the southern shore of Mykonos. "Search for the Marble Quarry in Tavern Point. I was thrown down a pit along with the many bodies of exhausted slaves." As could be easily guessed, the tablet is pointing players toward the Marble Quarry in Tavern Point, on the Silver Island known as Mykonos. The quarry itself is named the Suenites Quarry, and it can be found just off the island's southern coast. 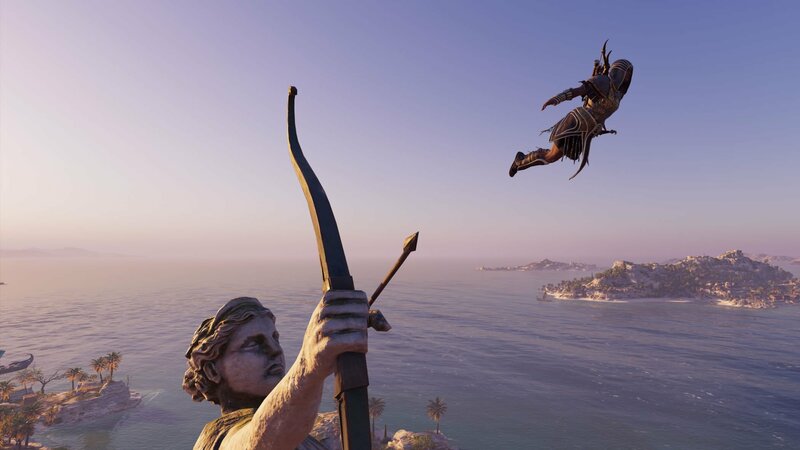 The pit being referenced in the phrase can be spotted quite easily with Ikaros, as it's not too far away from a massive statue of Agrotera — one of many epithets of the Greek goddess Artemis. On-site at the quarry, look for the square-shaped pit that etches its way toward the southern shore line. On a ledge just before the marble touches the water, players will find a series of corpses in varying states of decay. Approach the one nearest the ladder — the one with some flesh and blue-hued clothing stil clinging to its bones — and use the Interact button to claim the reward: an engraving that adds +1 seconds to Intoxicated Duration. With the grisly procedure of procuring the Marbled Morale Ainigmata Ostraka reward now completed, heroes are free to move on to the rest of Ancient Greece's hidden secrets. 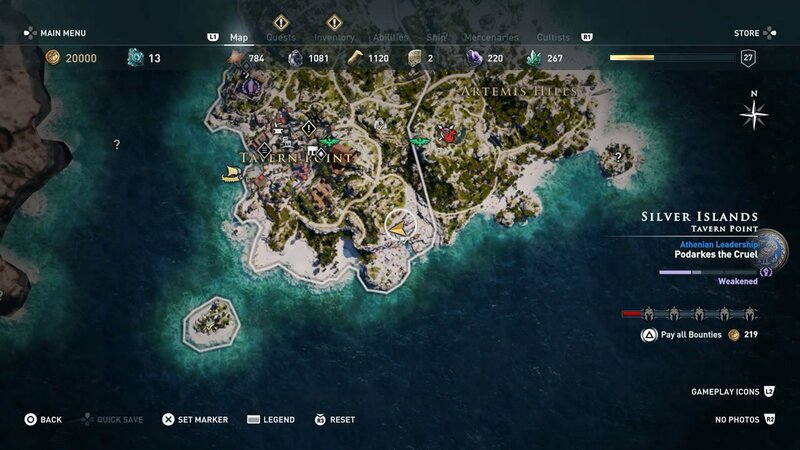 To learn about other Ainigmata Ostraka treasure hunts, boss strategies, or various game mechanics, be sure to stop by Shacknews' Assassin's Creed Odyssey walkthrough and guide.